Kendal’s best known food is Kendal Mint Cake, a mountaineering concoction of sugar, glucose, water and peppermint oil, but at Hog Roast Kendal we offer something a bit healthier. Hog roasting is an ancient method of cooking, from days when people had little more than an open fire. These days things are a bit more modern – lightweight stainless steel machines, with gas burners for even cooking. It’s a lot safer and more hygienic. It’s also healthy – no oil needs to be added to a whole pig. The meat bastes in its own juices, leaving it wonderfully tender and full of flavour. One of our most popular venues is the local pub, of which Kendal has a multitude. We often provide post-match or half-time snacks to enthusiastic football fans who’ve gathered together to watch the game. It always goes down well, in victory or defeat, when there are hog roast sandwiches to go round. At Hog Roast Kendal our chef prepares everything on site while the roast is cooking. The perfect pig can take several hours – around six on average – giving plenty of time to get ready. Simple sandwiches are one of our most popular options: soft rolls packed with the succulent meat, sweet apple sauce, and sage and onion stuffing, with crunchy crackling on the side. However, if simple is aiming a little low, we also offer alternatives. We can provide a buffet to go with the roast, or different meats for those who can’t or won’t eat pork. Lamb works really well in a sandwich with mint, turkey with cranberry, beef with horseradish, and chicken with stuffing. For those who want it more like a barbecue, we can offer burgers and sausages, and we can even provide vegetarian options on request. In fact, for the ultimate in indulgent dining, we can even offer a roast as part of a full formal dinner, with multiple courses and waiting staff. All this without compromising on quality, or variety of location. Kendal has plenty of other places to have a hog roast. As well as the ever-popular garden party, there are a number of festivals in the town that provide an opportunity for a feast. There’s the music festival Kendal Calling, Kendal Festival of Food, and the Kendal Mountain Festival. Although no real mountains are actually climbed, the latter is a celebration of mountain culture in film, literature, and art. Just thinking about it makes us hungry! Like all places with a food festival Kendal has a love of local produce, and at Hog Roast Kendal so do we. The importance of picking a supplier can’t be underestimated, and that’s why we always look to local for our meat. We feel it helps us to meet our customers’ high expectations if we can assure them where the roast has come from, and the taste of fresh produce just can’t be beaten. 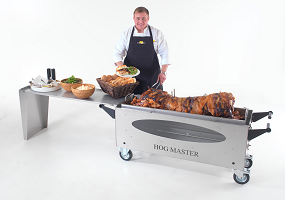 You may not be able to take it up a mountain, but a hog roast is always a popular and tasty choice.